DRAWinternational fosters artistic research to promote and reveal ideas within a contemporary context. Drawing – features as an interface between theory and practice. Research – to help locate a contextual framework. Action – as a conscious and unconscious move toward meaning. Workshops – the taught programme to experience creative potential. DRAWinternational offers international artists, teachers and students the opportunity to extend professional practice through cultural exchange. Deanna Petherbridge is an artist, writer and curator primarily concerned with drawing. Her practice is drawing-based (predominantly pen and ink drawings on paper), although she has also produced large-scale murals and designed for the theatre. Her most recent solo exhibition was Petherbridge Alone with Soane, in Sir John Soane's country house, Pitzhanger Manor, Ealing, 2008, which accompanied an exhibition of eight international artists in the PM gallery, curated by herself, entitled Drawing as Vital Practice. Deanna Petherbridge is Professor Emeritus, University of the West of England, Bristol. She was Professor of Drawing at the Royal College of Art from 1995 to 2001 where she launched the Centre for Drawing Research, the first doctoral programme in drawing in the UK and ran an extensive course of drawing workshops and open lectures for the whole college. Her latest publication, The Primacy of Drawing: Histories and Theories of Practice published by Yale University Press in 2010. It examines the importance of drawing as significant practice in Western art history from the fifteenth century as well as its relevance to contemporary artists working with multiple practices. Paul Beauchamp studied at Loughborough College of Art (1967-68) and at Hornsey College of Art, London (1968-71). He completed postgraduate studies at the Slade School of Art, University College London in 1973. He has been a former chair of Ffotogallery Cardiff. As curator and member of the 'Artists' Project' he recently co-organised a European venture entitled “Sense in Place” 2005-06, between Wales, Latvia, Ireland, Spain, Iceland and Poland. Having exhibited widely in Britain, Europe and the U.S.A. he currently shows with 'Galerie Simple', Gstaad, Switzerland and is exhibiting "Tulipa Botanica, Lowbrids and Hybrids' at the Vestry, Empire Gallery,London September - October 2007. He works from his studio in Cardiff, South Wales. 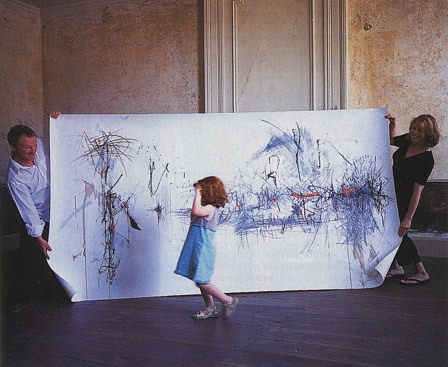 John and Grete with their daughter Aloise display a drawing created during a workshop. Pro Vice-Chancellor - Faculty of Arts, Computing, Engineering and Sciences Sheffield Hallam University. Graham Button gained his PhD in 1976 from the University of Manchester, where he was the Faculty Research Assistant. He joined the then Plymouth Polytechnic, subsequently The University of Plymouth, in 1975 where he worked as lecturer, senior lecturer and principal lecturer until 1992. In 1992 he joined Xerox's European Palo Alto Research Centre, Cambridge, as principal scientist, became Area manager for the Studies of Technology Organisation and Work group. He was then appointed Director, and subsequently Laboratory Director of Xerox's European research centre in Grenoble. Although having been responsible for the management and commercialisation of research within the industrial sector for many years, Graham has remained an active researcher in his own right with over 160 publications of various kinds. His research interests are in the analysis of action, interaction and work, and in how the study of their organising practices can be traded into the development of design methodologies and the design of computer systems. He took up his position as Executive Dean (now Pro Vice-Chancellor) of the Faculty of Arts, Computing, Engineering and Sciences at Sheffield Hallam University in 2005.